PC Pitstop is thrilled to announce that we’ve done it again! PC Matic blew away the entire field of products in the latest Virus Bulletin test with a record setting 99.9% RAP score! Virus Bulletin has been hailed by IT professionals as the most respected testing house, and PC Matic has continued on our path of out performing the competition on the RAP test. The VB100 test uses over a million samples to determine how effective the various antivirus products are at actually protecting their customers. Products are scored on a reactive and proactive basis, combining those scores to deduce the RAP score. PC Matic ranked first both proactively and reactively with an astounding 99.9% in both tests and a RAP score of 99.9%. Second place for proactive testing was 17.4% behind us and second place for reactive testing was 2.2% behind. The gap for reactive protection is typically smaller as all vendors are becoming proficient in blocking known threats. However, proactive test scores are used to show how a product performs against unknown threats. This means that second place missed more than 17% of the unknown files they were tested against. In an age where malware is often only used once, stopping unknown samples is key. This testing helps provide clear third-party evidence that our whitelisting protection is superior to our competition’s use of blacklisting and heuristics. The security industry, including the testing houses such as Virus Bulletin, place a higher value on not blocking good files (false positives) than accurately identifying bad files (false negatives). In the Virus Bulletin methodology, there is zero tolerance for false positives. If a product has one false positive out of a million, then the product fails VB100 certification. On the other hand, the exact same product can mis-identify hundreds if not thousands of bad files as good with little consequence on ratings and certification. The most recent Virus Bulletin testing included approximately one million good files, and PC Matic incorrectly identified less than fifteen thousand. This represents a 1% error rate or 99% whitelist accuracy rate. We’ve already made astounding improvements to our product’s stability and protection since we submitted it to this test so we expect to see an even better performance in the coming testing. very happy with the way pcmatic cleans up my computer…but i have issues with supershield, it disables things without my consent. on some sites i can disable adblocker to make video’s visible, used to be able to download off of youtube, but many are not available anymore, and can’t figure out why. have steam on my whitelist and last week, it disabled it again along with skype and a file conversion app i use. disabled supershield to industrial for a few days, and that helped solve the skype and conversion app, when i activated supershield again, but not youtube. i would greatly appreciate being told if i want something shut down without my consent. please tell me if steam and skype are bad, why soo many people using them!!! Sid, I’m sorry that you had an issue with Super Shield blocking something that it is not supposed to. In the future you can enable advanced mode under block notifications in the Super Shield menu and add a blocked program to your whitelist. We don’t recommend using this mode at all times so a malicious program is not added to the whitelist accidentally however it will help avoid these issues. If you have any trouble getting this mode turned on or adding files to your whitelist our customer support team is available 24/7 to assist you at pcmatic.com/help. @sid: Sorry about your problem. The entire top chart is a fraud. Please google the rap quadrant test results for both 2015-2016-2017 if you wish. No product has scored that high. They are listed as PC Pit Stop and are not even listed although I do know received VB100 certs for 1 or 2 operating systems around that year. They never scored highest but did squeek by. Now they are not even on the Rap test as you will see. The saying you get what you pay for is right and PC-Matic while inexpensive performs worse then most well known free AV’s. Please see the Virus Bulletin website to confirm the legitimacy of the top chart. You may do so here: https://www.virusbulletin.com/. If you wish to see the most recent RAP results, you can view the December results here: https://www.virusbulletin.com/virusbulletin/2016/12/vb100-comparative-review/. The chart listed within the article is far from fraud. I would encourage you to view the test results from December, and analyze that report. It will show that we did score that high, and left the competition in the dust. However, I am guessing some of the confusion is coming from PC Pitstop (the company name we test under) not being listed on some RAP quadrants. The reason being, we did not earn a VB100 Certification due to our false positive detection. Virus Bulletin has a zero tolerance policy for false positive, and since we treat all unknown files as bad, until proven otherwise, we will have false positives. I hope the explanation makes since, but if you have any questions, feel free to reach out. I’m no IT Expert (‘ex’ is a has been and a ‘spurt’ is a drip under pressure) and I’m no dumbass either, I haven’t found a better all around product than PC Matic anywhere out there to date. I use it and ONLY it. Why people feel a need to use 2 or 3 even 4 different AVs is beyond me. I have been using your product for about three years. I have had a problem with a virus about a year and a half ago. It cost me $150.00 to repair it. Last week I got hit with malware and it cost me another $150.00. Have you cured the problem so this doesn’t happen again? Can you tell me what I can do to prevent this from happening again! According to our helpdesk records, we have not received a ticket from you since 2015. Please contact us regarding the issues you have experienced. We will need to be sure you had SuperShield enabled at the time of attack. You can contact our support team via http://www.pcmatic.com/help. Thank you! I just read the report that this article is based on, and yes when taken out of context the RAP score looks great and epic even. However, if you read the entirety of the report it’s not so good. They only included the good parts of the report. And when compared many of the other tested products with little to no (and yes I mean 0) false positives, 13,753 false positives is a HUGE number. So in conclusion, while PC Pitstop’s product may work for computer novices (or worse) to keep infections away, those of us who know how to use a computer well enough to keep infections away by following safe usage practices and using some form of basic security software should and would never choose this product. I use and test far too many new software titles that would undoubtedly be blocked by PC Pitstop. Between that and the stability issues it’s enough to keep me away. I would use MBAM a hundred times over before PC Pitstop. Thank you for your feedback. We are consistently striving to make our security solution better, which is why we take part in these tests. The biggest take away we wanted to share was the detection rates. This is because people tend to buy AV protection without looking into its detection ratings. This is an issue with today’s cyber security threats. We certainly have some improvements to make, but overall our detection is rock solid. Thank you again for sharing your thoughts! @Kayla Thrailkill: I can’t find a link on the VIRUS bulletin to these results. 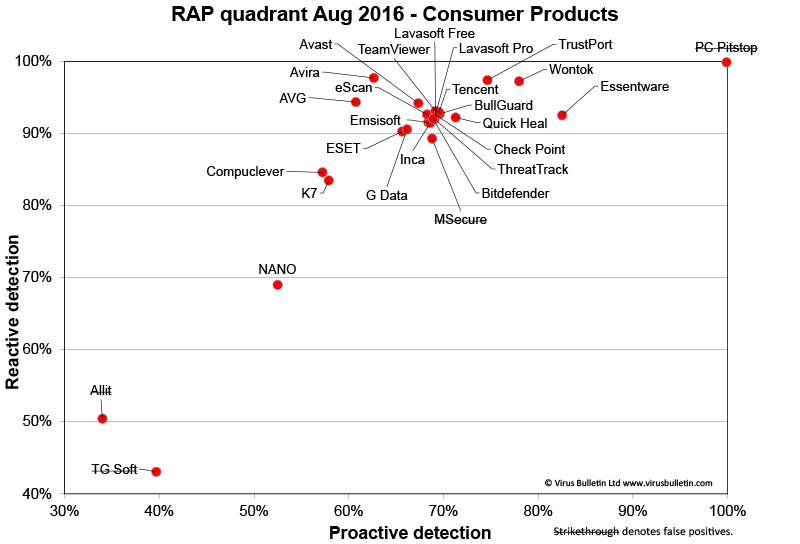 They have the latest RAP Quadrant results and PC Pitstop is not listed. I think it says there have to be two testings so maybe PC Pitstop only did it once? Please explain this discrepancy. The link you are sharing only shows the security solutions who won the Virus Bulletin Award. PC Pitstop did not, due to false positives. Although our false positive rate is less than 2%, the VB test has a zero tolerance. So if whether had one false positive or 20,000 we would still not be awarded. Here is the test results we reference in our posts. This link will show every security solution who took part in the August 2016 VB RAP test. It will also show their detection rates, and whether or not they obtained the VB Award. I hope my explanation was helpful, and assists in understanding the discrepancy. Have a great night! @Rob: Exactly my thought. These people are covering the fact that, the second worst product in the test has only 32 false positives, while others have less than 10 false positives (or none). 13,753 FPs is just ridiculous. Now, before you argue that there are millions of test samples and your false positive rate is below 2%, imagine that you have to run 100 executables a day (right now I’m having 150+ background processes autostarted with my Windows), and statistically 1 of them is going to be blocked, would you still say that 1% is very low? I’m not saying anything bad about your whitelisting methodology. On the contrary, I’d be more than glad to try this, if you can get a reasonably low false positive rate (by reasonable I mean maybe less than 1 in 10,000). Hello Yuping! I really appreciate the insight you’ve provided here and just wanted to add some more comments or information for you. We agree that getting a lower number of false positives is always a good thing, but don’t sacrifice our ability to stop malware to get less false positives. You can also see that in the most recent test we took part in with Virus Bulletin we lowered the number of false positives to 2,174 (https://www.virusbulletin.com/testing/results/test_from/2016-12/vb100-antimalware). With this low number of false positives, we actually had less false positives than many of the other solutions had false negatives. In addition, the false positive test includes around 850,000 good samples while the malware test only includes around 40,000. 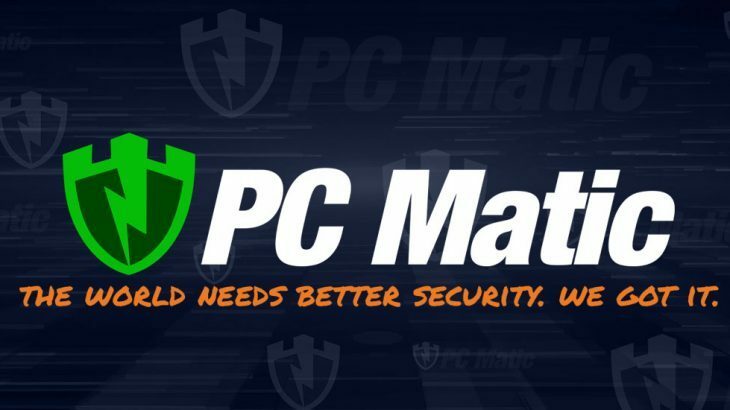 I hope I answered some of your concerns here and encourage you to give our protection a try, PC Matic comes with a 30 day money back guarantee so you can try it out! Have a great day Yuping! I trust Pc Matic. But I am worried that a product like Malwarebytes is able to stopl it from working in one computer. Pc Matic people must urgently look into this matter! If Malwarebytes can do that than other virus/malware can do it without we knowing it! Does PC Matic support XP OS? Please send me info about the prices for your various products. I have heard your advertisement for 5 computers for $50. I have XP and 8.1 operating systems. I plan to update from 8.1 to 10. How will that affect the 5 computer pricing? After the update to 10 OS will that count as one .computer because it is the same computer? I love PC matic. My computer was a nightmare until acquiring their software. Haven’t had a problem since! I’m so glad to hear that Michael! Thank you for the kind words. Have a wonderful weekend!